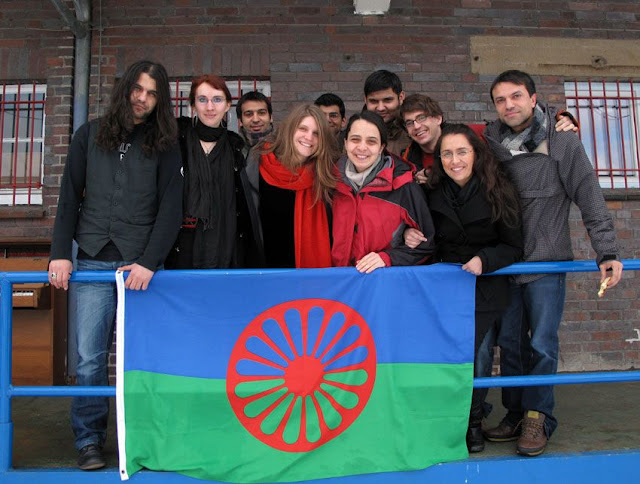 „Amaro Drom” is an intercultural self-organization of young Roma and non-Roma which was established in 2006. Our main focus is the socio-cultural youth work, the strengthening of self-initiative, mobilization, networking and self-esteem of young Roma and their politicial and societal participation. The consciousness about their origin, culture and history, as well as about the culture and history of the country where they live, plays an important role. As young Europeans we actively want to contribute to society for more acceptance and respect, mutual understanding and inclusion. Amaro Drom e.V. is member of the national German youth organization “djo-Deutsche Jugend in Europa” which unites many expelled, refugee and migrant youth organizations. The Roma community in Germany includes a wide diversity of cultures and backgrounds. Besides the German Sinti who have been living in the country since over 600 years, the great majority of Roma have immigrated in the last 50 years from all Eastern European countries, as guest workers in the 70s, 80s, as refugees from former Yugoslavia since the 90s and based on the new EU laws on free mobility. Most of these migrants have lost their traditional communities and social networks depending on their work situation or the hosting practices for asylum seekers and refugees. They face the same challenges regarding education and employment as other migrants, moreover, antiziganism and stereotypes about Roma are still widespread. (Multiple) identity plays a central role in the lives of many young Roma. Roma youngsters have a strong tendency to drop their identity. This is not very surprising, since Roma youth often are depicted in a negative way. Young Roma are confronted with negative stereotyping and are regularly depicted as being lazy or even criminal. It is very hard for young Roma to escape this stigmatization. Being a young Roma is often rather a ´forced framing´ than a freely chosen ethnic identity. Almost all Roma suffer from negative stereotyping. As a result, they often consider the outside environment to be hostile and therefore many young Roma decide to remain in the safer, familiar environment of their families and community. Therefore, we want to offer a space to Roma and non-Roma youngsters where they can discuss the different aspects of (multiple) identities. Youngsters are not only Roma; they have a national and European identity as well. And what about their relationships with non-Roma youngsters? What is more important, your ´ethnic identity´ or your identity as a youngster? How to deal with multiple identities? In order to understand the needs and the situation of young Roma we have to keep the two issues in mind (among others): a fragmented community of diverse cultural and national backgrounds, and the youngster’s quest of identity, between family traditions, negative stigmatization and the challenges of a globalized and changing world.